Justice Dept. 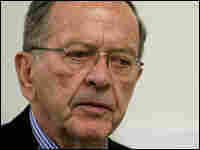 Seeks To Void Stevens' Conviction The Justice Department asks a federal judge to drop all charges against former Sen. Ted Stevens of Alaska. Last fall, a jury convicted Stevens of seven counts of lying on his Senate disclosure form. Allegations of prosecutorial misconduct delayed his sentencing. 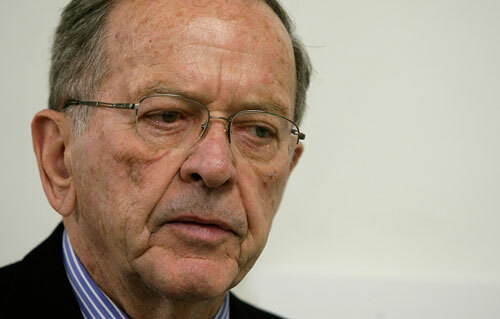 Ted Stevens lost his bid for an eighth full term in office just days after he was convicted in October. "The Department's Office of Professional Responsibility will conduct a thorough review of the prosecution of this matter. This does not mean or imply that any determination has been made about the conduct of those attorneys who handled the investigation and trial of this case. "I am grateful that the new team of responsible prosecutors at the Department of Justice has acknowledged that I did not receive a fair trial and has dismissed all the charges against me. I am also grateful that Judge Emmet G. Sullivan made rulings that facilitated the exposure of the government's misconduct during the last two years. I always knew that there would be a day when the cloud that surrounded me would be removed. That day has finally come. "It is unfortunate that an election was affected by proceedings now recognized as unfair. It was my great honor to serve the State of Alaska in the United States Senate for 40 years. "I thank my wife Catherine, as well as my family, friends, and colleagues in the United States Senate who stood by me during this difficult period. I also want to thank the great number of Alaskans who offered their prayers and support." "We are grateful to learn that Attorney General Eric Holder has decided to drop all charges against Senator Ted Stevens. That decision is justified by the extraordinary evidence of government corruption in the prosecution of Senator Stevens. "This jury verdict was obtained unlawfully. The government disregarded the Constitution, the Federal Rules of Criminal Procedure, and well-established case law ... which require the government to reveal to the defense all evidence that demonstrates the innocence of the accused. "The decision by President Obama's Justice Department to end the prosecution of Senator Ted Stevens is reasonable. I always said I didn't think Sen. Stevens should serve time in jail and hopefully this decision ensures that is the case. It's time for Sen. Stevens, his family and Alaskans to move on and put this behind us." The Justice Department on Wednesday asked a federal judge to drop all charges against former Sen. Ted Stevens of Alaska. A jury convicted Stevens last fall of seven counts of lying on his Senate disclosure form in order to conceal $250,000 in gifts from an oil industry executive and other friends. Stevens was the longest-serving Republican in the Senate. However, he lost his bid for an eighth full term in office just days after he was convicted. Since then, charges of prosecutorial misconduct have delayed his sentencing and prompted defense motions for a new trial. In a move first reported by NPR, U.S. Attorney General Eric Holder said he has decided to drop the case against Stevens rather than continue to defend the conviction in the face of persistent problems stemming from the actions of prosecutors. "After careful review, I have concluded that certain information should have been provided to the defense for use at trial," Holder said in a statement Wednesday. "In light of this conclusion, and in consideration of the totality of the circumstances of this particular case, I have determined that it is in the interest of justice to dismiss the indictment and not proceed with a new trial." U.S. District Court Judge Emmett Sullivan set an April 7 hearing on the motion to dismiss the case. Stevens' lawyers praised Holder's decision and said it was "justified by the extraordinary evidence of government corruption in the prosecution of Sen. Stevens." The lawyers, Brendan Sullivan and Robert Cary, called the case "a sad story and a warning to everyone. Any citizen can be convicted if prosecutors are hell-bent on ignoring the Constitution and willing to present false evidence." Stevens said, "I always knew that there would be a day when the cloud that surrounded me would be removed. That day has finally come. It is unfortunate that an election was affected by proceedings now recognized as unfair. It was my great honor to serve the state of Alaska in the United States Senate for 40 years." Judge Sullivan has repeatedly delayed sentencing and criticized trial prosecutors for what he has called prosecutorial misconduct. At one point, prosecutors were held in contempt. Things got so bad that the Justice Department finally replaced the trial team, including top-ranking officials in the Public Integrity Section, which is charged with prosecuting public corruption cases. The straw that apparently broke Holder's back was the discovery of more prosecutorial notes that were not turned over to the Stevens defense team as required by law. The notes were discovered by the new prosecution team, which was appointed in February. With more ugly hearings expected, Holder is said to have decided late Tuesday to pull the plug. His decision is said to be based on Stevens' age — he's 85 — and the fact that Stevens is no longer in the Senate. Perhaps most important, Justice Department officials say Holder wants to send a message to prosecutors throughout the department that actions he regards as misconduct will not be tolerated. Holder began his career in the Public Integrity Section; according to sources, he was horrified by the failure of prosecutors to turn over all relevant materials to the defense. The attorney general also knows the trial judge, Emmett Sullivan, well. The two men served together as judges of the Superior Court of the District of Columbia before each was promoted to higher office. Holder respects Judge Sullivan and reportedly has watched with growing alarm as the judge repeatedly has scolded prosecutors for failing to follow his judicial orders to fully inform defense lawyers about everything from potentially favorable evidence to the travel plans of witnesses. During the trial, prosecutors' missteps led the judge to instruct the jury to disregard some evidence. Sentencing has been repeatedly delayed. By last month, it was playing a back seat to charges of prosecutorial misconduct —as a whistle-blowing FBI agent made complaints about improper conduct by a fellow agent and prosecutors. With a hearing scheduled in two weeks to explore those charges, Holder decided to review the case himself. In addition to Wednesday's decision to drop the case against Stevens, Holder has also ordered an internal Justice Department review of the prosecutors' conduct. An adverse decision from the Office of Professional Responsibility would be ruinous for the prosecutors, including the top two career officials in the Public Integrity Section. Justice Department officials say they will withdraw their opposition to the defense motion for a new trial and will dismiss the indictment, in effect voiding the Stevens conviction. Many Alaskans expressed relief at the Justice Department's decision. It is unclear what the effect of Wednesday's action will be on the four-year-old federal investigation of public corruption in Alaska. That probe has produced 10 convictions of state legislators, lobbyists and businessmen. Investigators there have in their cross hairs a leading congressman and the former state Senate president: Ben Stevens, son of Ted Stevens. "That's the big question," said Richard Mauer, a reporter for the Anchorage Daily News. "What does this do for the ongoing investigation?" There are ironies aplenty in the Stevens case. The 40-year Senate veteran pushed for an early trial date because he was up for re-election. If he hadn't done that, he might have been re-elected. Stevens, the man who helped make Alaska a state, was famous for bringing home federal dollars and led the charge to fund the Bridge to Nowhere. He was hugely popular in the state for decades. A week after his conviction, he was defeated by a narrow margin. Sen. Mark Begich (D-AK), who defeated Stevens in the November vote, called the decision to end Stevens' prosecution "reasonable." "I always said I didn't think Sen. Stevens should serve time in jail, and hopefully this decision ensures that is the case," Begich said. "It's time for Sen. Stevens, his family and Alaskans to move on and put this behind us." In a written statement that followed Holder's decision, Stevens said that he always knew the day would come when the cloud surrounding him would be removed. Today, he said, that day has come.